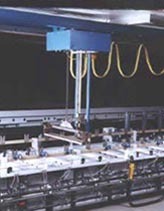 Manual and Automatic processing equipment systems for plating aluminum, steel and stainless steel parts with copper, nickel, chrome, brass, silver, gold, tin, lead and others. 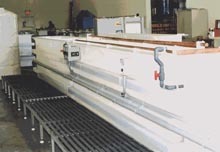 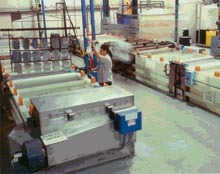 Systems include process and rinse tanks, rectifiers and buss work, heated temperature controls, solution agitation and filtration, overhead and sequential stepping hoists, ventilation hoods, fume scrubbers, water conservation systems, electrical control panels and all electrical and plumbing interconnects between related components. 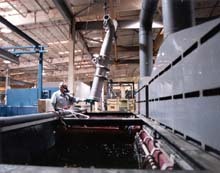 fume scrubbers, electrical control panels and all electrical and plumbing interconnects between related components. 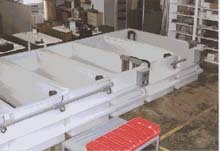 Large tank systems specifically designed for hard chrome, nickel and cadmium plating of extraordinary sized aircraft parts.